It is tempting to think of happiness as a soft quality, and a largely individual one. In recent years, however, researchers are studying and measuring the collective happiness of organizations and nations. Additionally, they are looking at how happiness relates to productivity and economic growth. International Day of Happiness is an opportunity for business leaders to reflect on the connections between happiness, productivity, and growth—in their own lives, and the lives of their organizations. 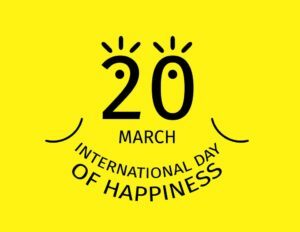 The story of International Day of Happiness Day founder Jayme Illien offers some clues as to how we might connect the dots. Abandoned as in infant in India, Illien was rescued and taken to Mother Theresa’s International Mission of Hope orphanage. He was adopted by an American mother, attended Tufts University, and went on to a successful career in finance. His philanthropic and humanitarian work led him to become an advisor to the United Nations, where he successfully advocated for a U.N. resolution declaring the pursuit of happiness to be a fundamental human right. The resolution, adopted in 2012, explicitly calls for a new economic paradigm centered around happiness and freedom. Spurred by gratitude for the gifts he had been given, Illien was inspired to find ways to create happiness and opportunity for others. It is a path we would all do well to follow. Why does the U.S. lag in happiness? The U.N.’s Sustainable Development Solutions Network issues an annual World Happiness Report, using a variety of measures to gauge the overall happiness of nations around the world. Last year’s reportfound the U.S. ranking had fallen from third place in 2007 to 18th place. Countries that scored better in happiness were characterized by “high levels of mutual trust, shared purpose, generosity, and good governance.” A chapter in the 2017 report, “Restoring American Happiness,” argues that a decade-long fall in the U.S. has been driven by, among other things, a declining sense of freedom and belonging. Leading researchers in health and positive psychology have found that simple gratitude practices can dramatically improve our sense of well-being and our physical health. Such practices can include keeping a gratitude journal and making a habit of thanking employees and colleagues for their efforts. Working with clients to cultivate gratitude is a cornerstone of my executive coaching. Gratitude not only improves well-being and energizes our daily lives, but it also prompts us to take positive action. When we are mindful of our blessings and opportunities, we want to extend those same opportunities to others. With deliberate practice, we can choose gratitude and set in motion the same virtuous cycle of gratitude and generosity that prompted Jayme Illien to create the International Day of Happiness. Emotional contagion can cut both ways—it can work as either a positive or a negative influence. Purpose-driven joy in meaningful work can inspire the same enthusiasm in others. Conversely, stress and a negative mindset can spread like the flu. Evolved business leaders should model focus and flow in their work routines—and make a joyful commitment to shared purpose a defining feature of company culture. Business leaders who approach work joyfully and live in a flow state will naturally seek to share that mindset with others. Employees who are entrusted with meaningful work and the ability to exercise initiative will respond with increased commitment and productivity. A happy workforce is an engaged workforce. In an economy where innovation depends on collaboration and a healthy organizational culture, command-and-control leadership is a relic of the past. Today’s greatest leaders think of themselves as servant-leaders helping others find joy and fulfillment in their work. For them, happiness and economic growth work hand-in-glove—just as the U.N. resolution suggests. It is no accident that the International Day of Happiness coincides with the vernal equinox, the coming of Spring. Jayme Illien specifically chosethis day because, in many cultural traditions, it is celebrated as a time of renewal and new beginnings. We can all take this occasion to make a renewed commitment to a practice of gratitude, and to the generosity and positivity that flows from it. Restoring our national happiness will not take place overnight. One workplace at a time, we can build a stronger sense of belonging and freedom and take an important step in the right direction.